Well, it’s been a while for me not being in blog land. I hope that I can remedy that over the next several months. I have had pneumonia off and on since mid-July and the final third round of antibiotics did the trick. All the rehab that I went through has gone down the drain. I am probably going to have to start all over. Oh, my computer decided to get sick too. I think that we are both going to survive. While this was all going on I decided to become a Fun Stampers Journey (FSJ) Coach. I was a Stampin’ Up demonstrator for over five years and thoroughly enjoyed it, but the quarterly sales quota was a little steep for me to keep up. Fun Stampers Journey has quarterly sales that are very reasonable and workable. This is a new company and that means that whoever becomes a FSJ coach now is really going to get to watch this company grow and be a part of the excitement and earn income too. I am looking for people who love the arts and crafts industry, who love stamping and coloring, and who love paper and lots of it. If you are interested, please contact me. In the subject line please type Fun Stampers Journey. You can find out more information on becoming a FSJ Coach on my FSJ site. I would love to have you on my team. This is my first project with one of the FSJ stamp sets. 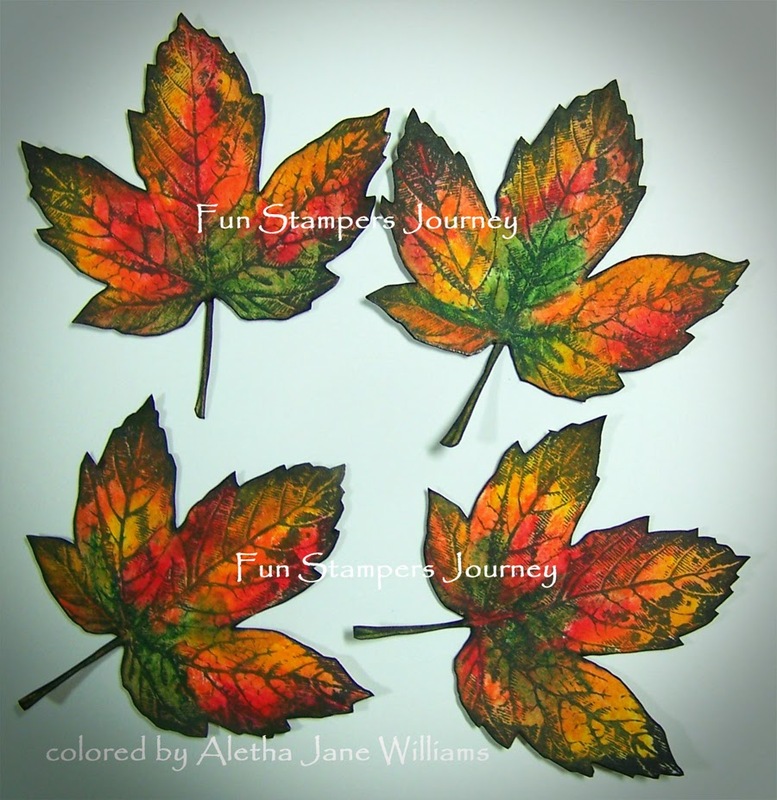 I fell in love with the set “Autumn Days.” When I saw the Sugar Maple leaf, I had to have the set. We have an abundance of Sugar Maples in our historic neighborhood. I tried to emulate the colors for my project. In the photo above you will see that I stamped the maple leaf four times with Black Licorice ink. (By the way, our inks are amazing. They are hybrid, meaning dye and pigment ink all in one.) Every time that I stamped with the Black Licorice I got a perfect image. After the images were dry, I used Derwent Watercolor Pencils in Beech Green, Hot Red, Tangerine, and Golden Yellow. I fussy cut each one and ran a Sharpie Black brush pen on the edges to hide the white edges. I hope that I got some of the Maple’s leaves fall color. 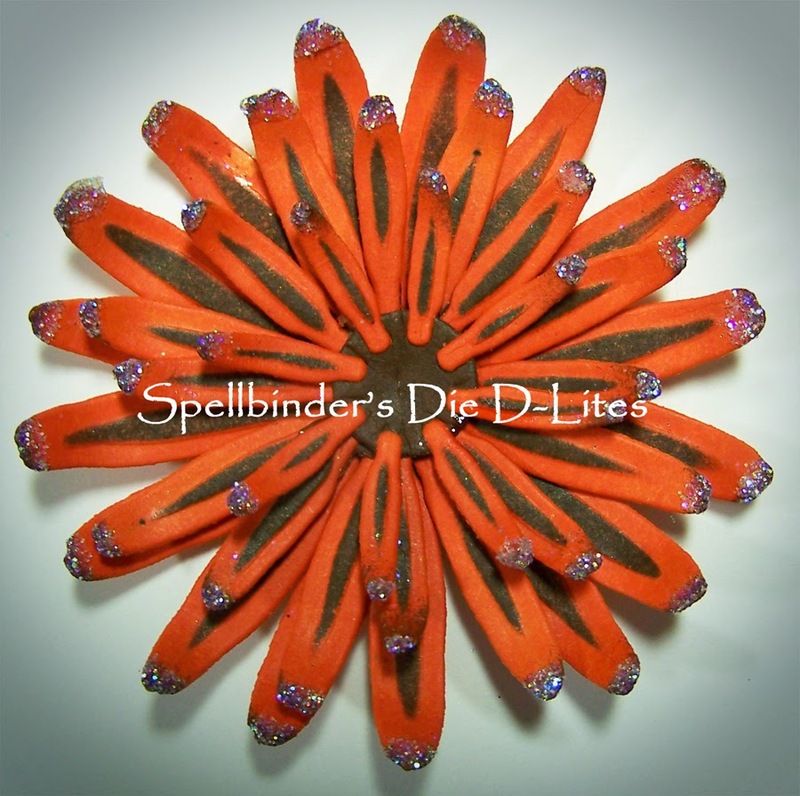 For my next element I attempted to make an Aster using Spellbinder’s Die D-Lite Create an Aster. I really wanted a mum, but after I made this I was satisfied. I used FSJ’s Orange Creamsicle cardstock and added Hazelnut Blend ink to the embossed areas. After that was dry, I added Tangerine Fusion ink to get a richer fall orange. Before assembling all the pieces I touched the tips of each petal with more Hazelnut Blend ink. The last highlight was some Journey Glaze and Journey Sparkle Dust on each petal end. Assembling was completed with Journey Glaze as my adhesive between the layers. My card base is Hazelnut Blend and Orange Creamsicle (don’t you just love these names) cardstocks. My designer paper is Bazill Basics Autumn Harvest collection. 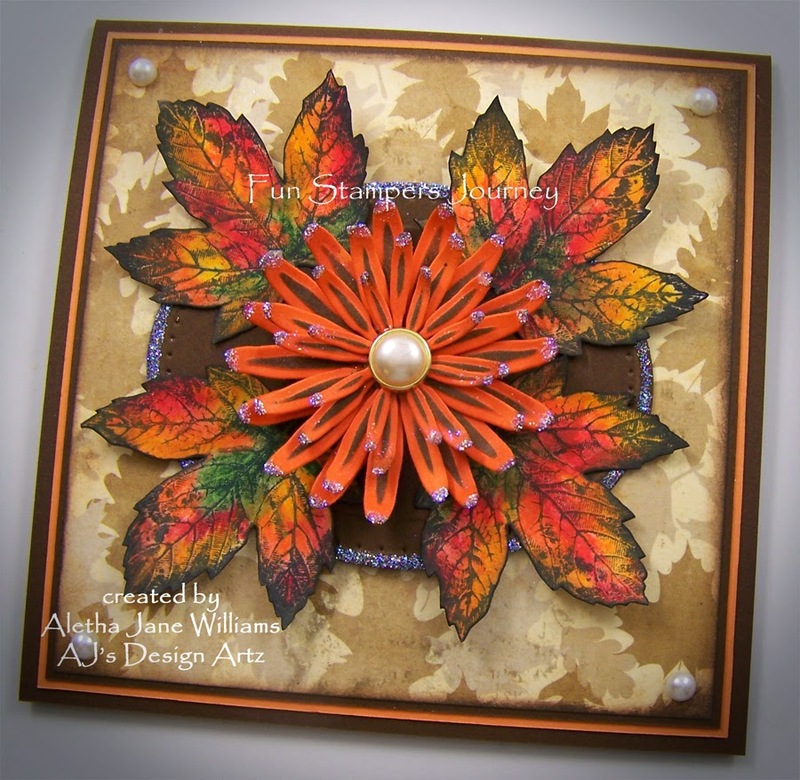 All of my elements, leaves and flower were layered on a die cut from Spellbinder’s Celebrations Pierced Oval in the Hazelnut Blend cardstock. To complete my card I added half pearls from my stash. Thanks so much for stopping by. If you need more information about my project or about Fun Stamps Journey, please contact me. Oh my this is stunning Aletha!! 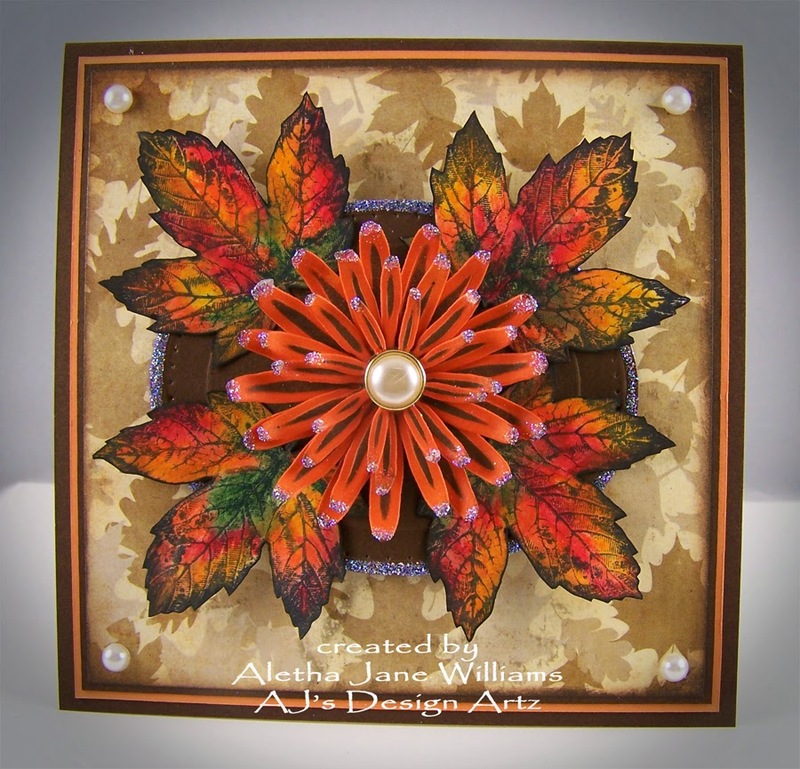 Love the autumnal shades and this is perfect for our Autumn theme. Thank you so much for sharing with us at Delicious doodles and good luck. This is a beautiful creation with great details. Love the colours and embellishments. All the elements work so well together. It is perfect for our 14th ‘ANYTHING GOES’ challenge. Thanks for sharing your talent with us. Good luck.